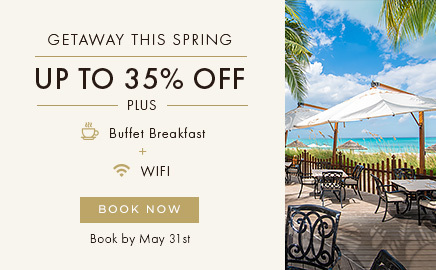 Located on 22 blissful acres of landscaped grounds, Seven Stars promises your kind of getaway, whether it’s relaxing on the beach, sitting by the pool, jumping into a kayak to explore nearby coastline, or taking in a glorious Turks & Caicos sunset on a two-hour boat cruise. 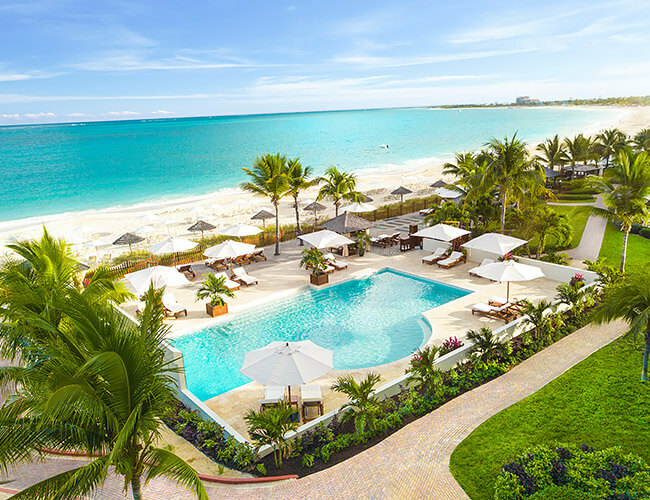 The island’s only heated saltwater pool, our magnificent family pool features a beautiful mosaic design and an inviting collection of sun loungers and cabanas. Nearby, an adults-only pool beckons those craving a quiet oasis for sunning and slumbering. Wherever you are, beach attendants are standing by, ready to offer a favorite cocktail, an ice-cold towel or the day’s tropical smoothie shot. A stay at Seven Stars Resort & Spa would not be complete without a day or two on the waters along our stretch of paradise. 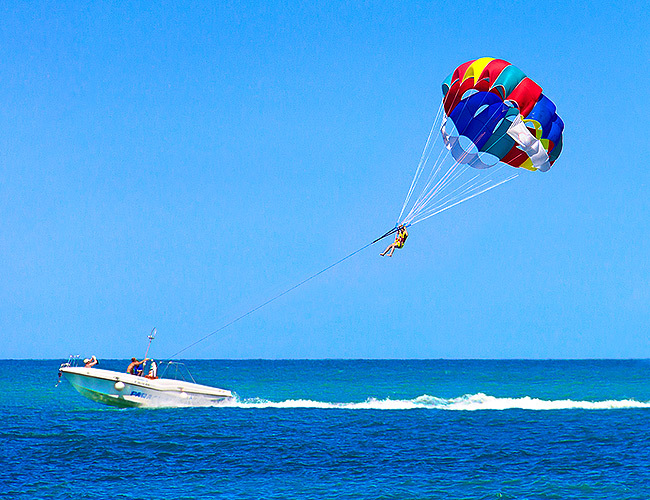 Our concierge will be happy to arrange a variety of excursions, from reef snorkeling to your own private beach getaway. The Turks & Caicos are a snorkeling paradise, showcasing the world’s third largest reef teeming with colorful tropical fish. Embark on a half-day or full-day adventure, with options available for all ability levels. The Turks & Caicos are known for the awe-inspiring sunsets that fill the skies with reds, pinks and oranges every evening. Enjoy a two- or three-hour cruise along the coast with views of the western skies. If you’re lucky, you’ll spot the famous green flash as the sun falls below the horizon. Suitable for all ages. Sharpen your serve on our well-maintined tennis court, which is lit for night play. Loaner racquets are available at no charge. Gather friends for a pick-up game (or practice your free throws) on our outdoor basketball court. Move over badminton, pickleball combines the best of tennis, table tennis and badminton into one fast-paced game. Revive your mind and body at Seven Stars, whether you’re into downward dog, an island-inspired massage, or an invigorating game of tennis. Overlooking the tennis courts, our gym features a range of cardiovascular equipment and resistance training machines. Focus on strength, balance, and flexibility on the west deck overlooking Grace Bay Beach, as you stretch to the sound of waves lapping along the shore. 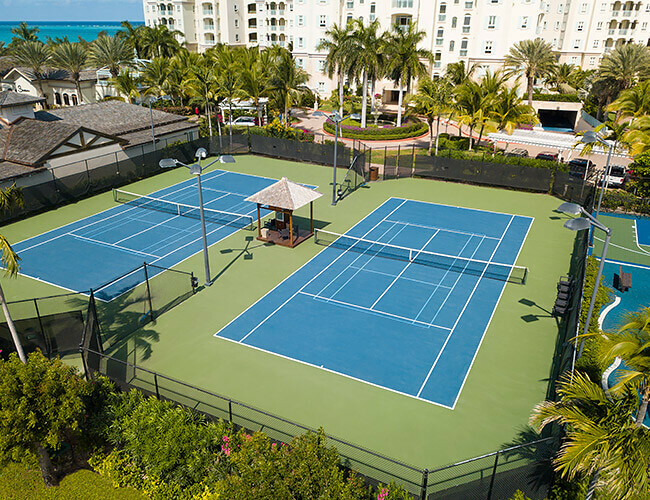 Seven Stars guests can fine-tune their forehand on our floodlit tennis court. Complimentary loaner racquets are available on request.